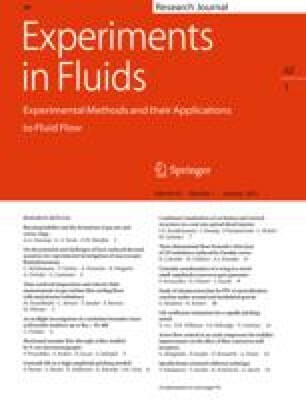 This paper presents the application of optical measurement techniques in dense-gas flows in a heavy-gas channel to determine planar two-component (2C) velocity profiles and two-dimensional (2D) temperature profiles. The experimental approach is rather new in this area, and represents progress compared with the traditional techniques based on thermocouple measurements. The dense-gas flows are generated by the evaporation of liquid nitrogen. The optical measurement of both the velocity and density profiles is accomplished by the implementation of particle image velocimetry (PIV) and background-oriented schlieren (BOS) systems. Supplemental thermocouple measurements are used as independent calibrations to derive temperatures from the density data measured with the BOS system. The results obtained with both systems are used to quantify the dilution behavior of the propagating cloud through a global entrainment parameter β. Its value agrees well with the results obtained by earlier studies. A mass and a momentum balance are formulated for a generic “differential element,” defined by a box delimited by an inlet and outlet vertical plane at two locations downstream of the release chamber and the top surface of the cloud propagating between both locations. Both equations are used to deduce β. For modeling purposes, the velocity u and the density ρ, which is actually deduced from the temperature Ta in the cloud, are averaged over the height H of the cloud. The free atmosphere is described by the ambient density ρae and the temperature Tae. with c1=u2+gH (1−Ta/Tae), c2=gH (Ta/Tae−0.5), and c3=c1−2u2. The last term on the RHS in Eq. 9 is related to friction at the ground surface and its value can be up to 30% of the value of the first term. The friction factor cf is derived from the local friction factor c′f=0.0592(Re x )−1/5 for a flat plate, which is averaged over the distance between the inlet and the outlet of the differential control volume. The value cf=0.0064 obtained is close to the value cf=0.0060 suggested by (Britter 1987) for dense-gas dispersion.